Once you have a count there is a tendency to stay with this count and adjust it over time. At the start these adjustments are small but after a while they add up. Eventually, this can lead to counts which just don't look right anymore. Having had my long-term count for more than three years it has changed from a simple zigzag into a double zigzag and currently into a triple zigzag. Triple zigzags occur only very rarely though, and in fact, I think the count looks very unproportional. I actually like it much more than my previous count. It's much simpler and many problems are gone. You could count wave [C]/ slightly differently. 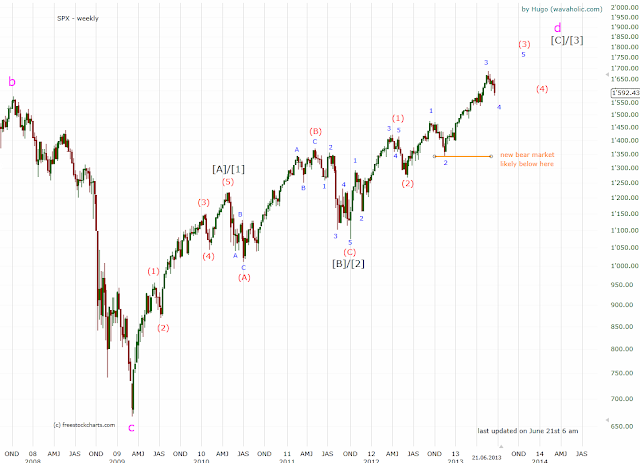 It is possible that we are still in wave 3 of (3) or already in wave (4). The very-long term count remains the same. I still think that eventually we will end up at levels lower than in 2009.